The generational debate has long since arrived in jazz as well. Where some see its salvation in the unswerving dedication to tradition, others categorically reject any closeness to jazz roots. Trombonist Nils Wogram is a man of creative balance. With groups like Nostalgia and Root 70 but also in other constellations, he was constantly finding new fulcrums between past and present, looking back and looking forward. The particular charm of his musical adventure has always been that he gets by without any program or didactic approaches. 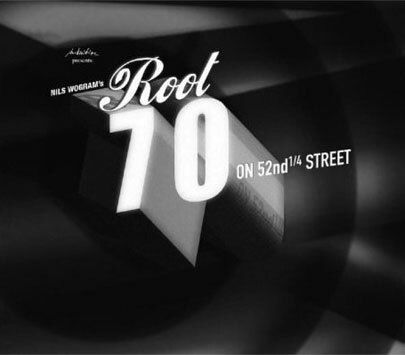 So it is too on the new Root 70 album, with the mysterious title Root 70 on 52nd 1/4 Street. The "1/4 Street" sounds a bit like something from Harry Potter, but the approach taken by Wogram, saxophonist Hayden Chisholm, bassist Matt Penman, and drummer Jochen Rückert was very different. Although they too do a little magic. They seduce the listener back to an era of jazz long before their own birthday, which is manifested in the band's name. Root 70 with an album of standards? Anyone who listens closely, however, will be pleased to find that isn't the case. Root 70 is on a secret mission to lure any listener who is so inclined into an imaginary past. In other words, they play standards that are not standards at all - as familiar as they may sound - but were all written by them. Nevertheless - and this is what makes their playing so ambiguous, then and now - precisely by doing so, they are appealing to the great moments of jazz. "All of them are based on Broadway pieces," as Wogram explains the rules of this game. "That is not really new, of course: Charlie Parker too wrote new themes on familiar chord sequences. We wanted to make an album that sounded superficially like straight-ahead jazz but is full of shifts of intonation in the details." Root 70 on 52nd 1/4 Street is far more than the new wine in old bottles so often cited in jazz. Wogram and company were by no means content to dress up new songs in bebop clothes. They used recording techniques for the CD such that the attentive ear will sense a waft of authenticity coming out of the speakers, but sounds slip into the songs that have never been heard in the context of mainstream jazz. And that is precisely where the 1/4 Street comes into play. But Nils Wogrom can explain that best himself: "All of the pieces are structured so that we used twenty-four notes in all, not just the twelve chromatic ones. That means there is another small step between the semitones. We used it in very different ways: sometimes a bit bluesy in single notes, sometimes as a whole chord that is shifted slightly, sometimes there is a bass line with certain transitional notes. It produces a slightly different sound." The new Root 70 album is intended for very different kinds of listeners, who perceive jazz in general and this CD in particular from almost antithetical perspectives. When confronted with these new pieces, traditional jazz listeners may feverishly try to recall where they known them from, while fans of more recent jazz sounds will discover with surprise that the tradition is not so bad, after all. "The challenge was to make something that not only plays well and stays close to the original. If that had been the case, you may as well have listened to the originals from 1957," Wogram notes. "We wanted to retain the sensual level of the music but then make something new out of it. We could have made a quarter-tone album that was completely dissonant. But we did not want to destroy the traditional mood of the music, so that the listeners can find their way into it on one level or another or even listen to it on two levels." With its undogmatic declaration of faith in jazz roots, the quartet offers an effective counterpoint to the current euphoria over jazz tradition. Even if the four members allude to their forebears in jazz history, they do not do so on their knees but at eye level. "Charlie Parker and Dizzy Gillespie were absolutely avant-garde back then," Wogram reminds us. "They came out of swing, but they were totally radical for their time. There is, after all, an artistic thinking behind jazz that goes far beyond the idea of reproduction. For all the veneration, you have to think about why Coltrane and Parker were so good back then. Because they were original and resolute." Root 70 likes to recapitulate the good old times too, before the Beatles, when just was still truly popular. But they always seek and find a way to connect their fictional memories to the present. Precisely in that delicate point, they stand apart from the lethargic majority of jazz musicians who "either are not in a position to find the beautiful aspects of the tradition or those to whom simply nothing new occurs any longer." Root 70 on 52nd 1/4 Street is a concept album by a band that really operates in a concept-free space. Even if the band has set itself a conceptual framework this time, they do not beat the listener over the head with their conceptual cudgel. The pieces are passed on with an unprogrammatic legerity. You can get lost in the melodic power of the themes, in the interaction of the musicians and the soloists, without having to waste even a single thought on the superstructure. A coherent and powerful jazz album, made in and for the new millennium, with a conceptual surplus value that offers a cornucopia of options for the future.